- Gorgeous handmade pure silk runner made in pure silk and cotton by our talented weavers. - The design of this rug is Kashan which has been originated from the southern part of Persia in 17th century. - This is a Handmade Kashmir Pure Silk on Cotton rug. 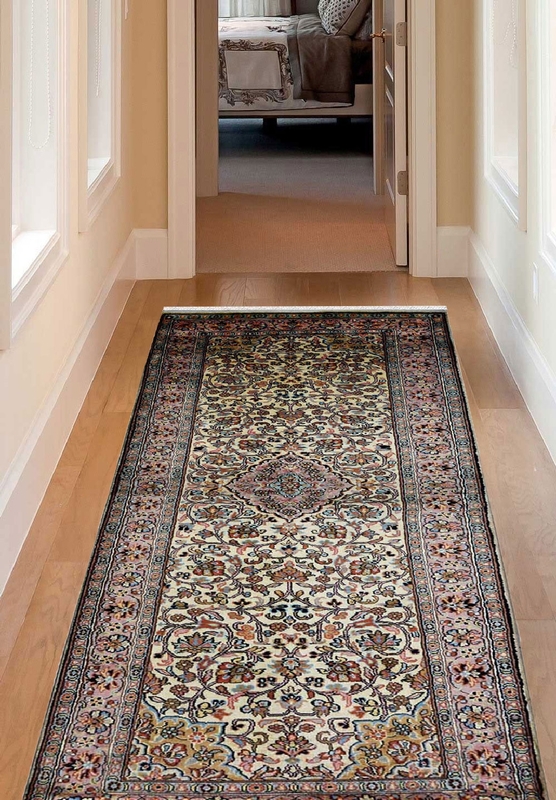 - Number of Knots in this rug are 324 knots per square inch and it has taken about 4-5 months to weave this beauty. - The rug has a floral design all over in an ivory background encrusted with a tiny medallion in black right in the center. - Perfect for a passage rug or can also be used as a wall hanging. Vacuum regularly in the direction of the pile. Clean liquid spills immediately with a damp cloth or sponge. For hard to remove stains, professional rug cleaning is highly recommended. Avoid direct and continuous exposure to sunlight. All of our rugs are professionally washed and are individually inspected before leaving our warehouse. This rug is currently in stock and includes FREE shipping worldwide. We try our best to display the most accurate images. There might be a slight variation in color between the actual product and your screen due to difference in computer monitors. Please note that lengths and widths may slightly vary from published dimensions although we strive to provide the most accurate measurements possible.